Anyone who knows my reading tastes knows that I am a sucker for anything to do with mediums and séances or ghosts and mysticism from around the turn of the century. I have always loved a good ghost story, although they terrify me, which is weird, since I don’t believe in ghosts in the slightest, so I am not completely sure where the terror or the obsession comes from. Honestly, I would love for ghosts and spirits to be real, just like I would love for magic and the supernatural to be real. How cool would that be! But I just don’t. That doesn’t stop me, however, from loving stories about it, and there is something about the darkness of the mid-1800s to early 1900s, revolutionary scientific and technological advances were being made and society was starting to modernise, while at the same time there was a trend towards dark and sensational tales. Mediums and spiritualists were all the rage – from high society to the dirt poor, everyone wanted to hear their future or talk to the dead. The mediums themselves were celebrities and the techniques they employed to trick the masses; or help those suffering with their losses (How charitable the mediums were as they stole all of your money) were incredibly ingenious. 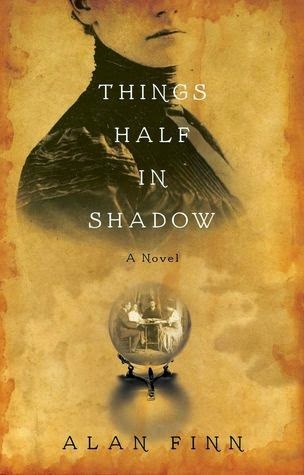 So when I saw the description for Things Half in Shadow on Net Galley, I knew that I wanted to read it. So far, I am thoroughly enjoying this novel. Edward Clark works as a reporter in Philadelphia in 1869 and has just been assigned with defrauding all of the mediums in the city. It’s not a job that he is the least bit interested in, he doesn’t believe in spirits or ghosts, and has no interest in becoming involved. However, his soon-to-be father in law, Thornton Willoughby of Willoughby Hats, thinks that it is a brilliant idea and since Edward very much wants to please his prospective family he agrees to take on the case. His first defrauding is a resounding success, except that he has underestimated his mark. See, Edward Clark is a man with secrets, secrets that he has done a very good job of hiding from everyone, until he gets on the wrong side of Lucy Collins. Threatening him with the demise of his carefully constructed new life, Edward unwillingly agrees to take Lucy on as his partner in defrauding the other mediums in the city. On their first night out Lucy and Edward see some things they can’t explain and they talk to spirits from their past, spirits that their medium could know nothing about. The action doesn’t end there though and the next day they both find themselves murder suspects. Like I said, I am thoroughly enjoying the story. Alan Finn, the pen name for mystery writer Todd Ritter, has done a great job of re-creating postbellum Philadelphia – with emotionally and physically wounded soldiers back from war, unsure how to live in peace and unsure of their roles in the world anymore; women who are starting to demand more for themselves; and class distinctions and barriers that were slowly starting to be broken down, although everyone is still painfully aware of the divisions. My only complaint so far would be with Edwards’s character. I really enjoyed him at the beginning, but I am finding that his character is just a little too weak; he gets a little too surprised whenever he encounters a woman with a backbone. Although that’s not completely right – he is happy when his finance, Violet, shows strength in supporting him, but annoyed when Lucy shows strength in disagreeing with him, or acts too forward and independent. I am pretty sure that Finn is attempting to show us Edward growing as a man and learning the value of women – but I’d rather like it if he had had a little more respect to start with. It’s not just with women though; in general he backs down pretty quickly and gets walked over a fair bit. He is afraid of anyone thinking anything negative about him and will avoid confrontations at any cost (except with his valet – which slightly annoys me, since I see this happening only because Edward belongs to a high class of citizen. Although, to be fair, his valet deserves it). His aversion to taking a stand creates some rather messy situations that could have been easily avoided, but also don’t really further the plot, so I am not sure why it’s necessary for him to be such a simpering man. My assumption (and I could be totally wrong) is that Finn is trying to show us a man caught up in an adventure that he wants no part of, but is being forced by circumstances beyond his control – however this could have been accomplished without turning Edward into a bit of a man-child. I am definitely biased though; I have a natural aversion to weak willed heroes. Luckily my problems with Edward are not really affecting my enjoyment of the story itself. There is enough spookiness and unanswered questions to keep me going. I am curious about the role that the bees seem to be taking (they keep appearing in visions of those who have passed) and I truly have no idea who the actual murder is. I am not sure at all what direction the story is going to take – will the ghosts and spirits be real? Or a conjuror’s trick? And what really happened to Edward’s mother when he was a child? These are questions that I really want answers too – so back to the kobo for me! I've been thinking about the perfect tea to compliment this story and I think I have come up with a good one. The Spice is Right is a sweet, spicy tea from David's. Its one of my favourites - there is just enough spice to make things fun, but not enough to overwhelm. I think that maybe if Edward had a little more spice in his morning tea maybe he'd find it a little easier to have a little more fun?